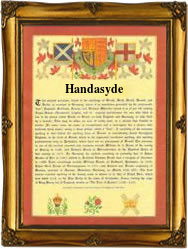 Recorded in the spellings of Handasyde, Handyside, and Handaside, this famous Scottish Border surname is locational. It derives from the lands of Handyside, (in the modern spelling) near Berwick. The precise translation of the surname is uncertain. The original spelling appears to be "Hanggansid", which is probably "the wooded lands on the hillside" or similar. The nameholders are not strictly a clan, however the chief holds the title of "all that Ilk", a terminolgy of equal status. The original chiefs are first mentioned in charters at the end of the 14th century, John Hangandsyde, being a charter witness in relation to lands owned by the abbey of Kelso in 1399, the relationship between this abbey and the nameholders, being very close. In 1467 one Patone de Hangalsyde was a juror in regard to fishing licenses on the river Tweed, whilst in 1563, the chief, Richard Hangansyde of that Ilk, transferred lands in Berwickshire to his son Alexander. In 1567 it is recorded that Elizabeth Hangetsyde and Dandie Hanginsyde, who despite the variant spelling, seem to have been sisters, were tenants of the lands of Kelso Abbey. Charles Handasyde, who flourished in the mid 18th century, was regarded as one of the most successful minaure painters of his period. The first recorded spelling of the family name is shown to be that of Richard de Hanggandside, which was dated 1398, in the barony of Bolden, Berwickshire, during the reign of King Robert 111 of Scotland, who reigned from the year 1390 to 1406.